Art museum director Michael Govan is perhaps the greatest fan of the futuristic design in the works for the Los Angeles County Museum of Art. LACMA’S DESIGN traverses over Wilshire Blvd. View above faces west, with the 5900 building behind the proposed gallery. “I think it’s going to be beautiful… It will be fantastic,” he enthused one day last month. 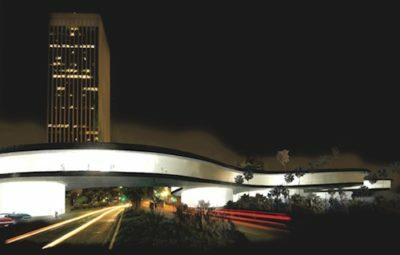 The $600 million project, which includes a gallery space over Wilshire Blvd., is planned to open in 2023. Its designer, Peter Zumthor, of Switzerland, is among the “greatest architects in the world,” has built two world-class museums in Europe and this will be his U.S. showcase. “But that’s not the point,” says Govan. 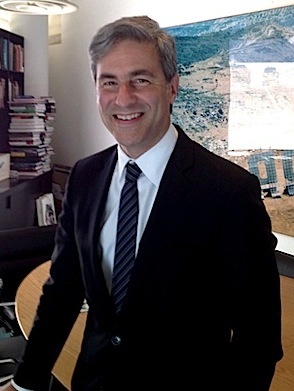 LACMA CEO Michael Govan prepares for 2023 opening. The 100,000 square-foot museum will replace a hodge-podge design started in the 1960s. Four buildings will be demolished. (The Japanese Pavilion, Broad Contemporary Art Museum and the Resnick Pavilion will remain). In place of the demolished buildings (Ahmanson, Hammer, Art of the Americas and Bing) will be seven inhabitable pillars holding up a “table top” gallery space which will reach across Wilshire to the Spaulding Ave. parking lot. Standing on pillars 26 feet from the ground, the transparent glass building reflects a changing societal value system, moving away from the thick temple-like facades of the 19th century, Govan explains. The suspended design returns about two acres of ground space to the park. “That’s the genius of going across the street,” said Govan. He will soon visit Zumthor and his team in Switzerland prior to the project’s environmental impact review set to start with the city in late spring. Its opening in 2023 is timed to debut with the opening of a Metro subway station, what Govan calls, “a game changer” that will provide visitors from downtown and elsewhere easier access to the museum. Inroads in technology will make for a more refined, “revolutionary” experience. Viewers will be able to in a glance learn about the art and history of a picture in the city’s 300+ languages, predicts Govan. The Muirfield Road resident took over the reins at LACMA a decade ago, leaving friends behind who wondered why he and his wife and daughter left a good life in New York for a cultural wasteland. “Most of our New York friends didn’t see it as a step up. Now they’re all looking for houses in L.A.,” he smiles. An artist in his youth, Govan majored in art history and was drawn from graduate school to join the Guggenheim Museum. He stays in touch with artists throughout the country via his single-engine plane, and he will continue to plan exhibits, which during construction will take place in BCAM and the Resnick. “The idea is for us to close [partially] as [the Academy Museum] opens,” Govan says. The $388 million Academy Museum of Motion Pictures, under construction at the Wilshire May Co. building, is targeted for a 2018 debut. Glass bridges will connect the building to a sphere in the rear featuring a 1,000-seat theater and a rooftop terrace. A pizza oven, an à la carte menu and a full bar will greet visitors at Drago at the Petersen Automotive Museum. The Italian-California restaurant will be ensconced within the museum’s ribbon-patterned stainless steel façade, evoking the speed and curves of an automobile. Felderman, Keatinge and Associates is the architecture firm. Seating will include an outdoor patio shaded in the style of the exterior red metal ribbons. The restaurant opening is expected this summer. The recently completed renovation at the museum, designed by Kohn Pedersen Fox, added 15,000 square ft., while the original 1962 Welton Beckett building (once an Ohrbach’s Dept. Store) remained architecturally intact. Comedian Will Ferrell meets a life-size (puppet) sabertooth cat on his hashtag stop at the La Brea Tar Pits and Museum. Share your experiences at the world-famous excavation site at #HowDoYouMuseum. ICE AGE Hair Ball promises a wild time June 4. Wear an over-the-top hairdo to the annual Ice Age Hair Ball Sat., June 4, with cocktails, dancing and fashions inspired by the La Brea animals. Upcoming exhibitions at the Craft and Folk Art Museum focus on Los Angeles-based artists. CraftNight is on the first Thursday of the month and CraftLab is on the second Sunday of the month. Craft Affair, an annual gala, takes place in October. “We also have a new buyer in our CAFAM Shop, which has a new look and products. People can shop online, at cafamshop.org,” says spokesman Sasha Ali. The Korean Cultural Center, at 5505 Wilshire Blvd., is housed in a building that opened as a Bank of America in 1929. It was purchased in April of 1980 by the South Korean government, and was re-designed by Han Yu-jung. The museum has about 70,000 visitors per year who enjoy juried art exhibits, movies and language classes. 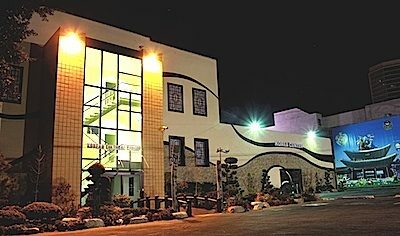 KOREAN CULTURAL Center has art exhibits, movies and language classes. Japanese language classes, traditional tea ceremonies and movies take place at the Japan Foundation, Los Angeles, inside the Wilshire Courtyard. The Los Angeles Museum of the Holocaust is the oldest Holocaust museum in the United States. Founded in 1961 by a group of survivors, the Museum moved to its permanent home in Pan Pacific Park, an award-winning building designed by architect Hagy Belzberg, in 2010. Learn German and attend cultural events at the Goethe-Institut, inside Wilshire Courtyard. Zimmer Children’s Museum offers sing-a-longs and more for toddlers on up.